About Maarit L. Message Maarit L.
Maarit was an excellent guide. She understands her city of Helsinki very well and her knowledge of Finland in general. Our group of 10 were all very impressed with the city and Maarit. TOUR GUIDE RESPONSE: Thank you, Don, for your kind words. It was a pleasure to make your acquaintance and I'm really glad you liked Helsinki. Maarit was an excellent guide for our family! We had two people in wheelchairs, and she was great at working out a tour that fit our needs. She was also very knowledgeable about each of the places that we visited. This was my second tour with Maarit, the first being the City tour. On this tour we went outside the city to visit Hvittraesk museum and Tarraspaa Atelier. We also enjoyed a boat cruise around the islands which I had requested. Maarit is well versed in art and architecture as well as many other subjects and is a good companion. Highly recommended! Excellent guide. Very knowledgeable and tailored tour to my interests. (Much appreciated.). Also provided a lot of information on what to do on my own. Highly recommended! TOUR GUIDE RESPONSE: Thank you so much, dear Laurie! It was a pleasure to meet you. Looking forward to our day tomorrow. We enjoyed a fabulous day with Maarit! She was so knowledgable and willing to change around the tour to meet our wishes. I would definitely recommend her to anyone traveling to Helsinki. Maarit was excellent. She was willing to work with us to plan just the right itinerary and was flexible when we needed to make adjustments. She was so personable and her narrative of what we were seeing was very engaging. Can't imagine a better tour guide or person! TOUR GUIDE RESPONSE: Thak you so much, dear Brenda. It was a pleasure to meet you. What a wonderful tour with Maarit! She was very knowledgeable on the history of Helsinki and enjoyable to be around. We loved lunch at a favorite place of hers and the market in Helsinki where we took the time to sit and have coffee. I would highly recommend this tour with Maarit. TOUR GUIDE RESPONSE: Thanks, Joe! It was a pleasure meeting you, too. Maarit was a very knowledgable and pleasant guide to be with. Her plan for our day tour was well thought out and we had a most enjoyable day seeing the sights of Helsinki with her. TOUR GUIDE RESPONSE: Dear Sandra, Thank you for your kind words. It was a pleasure to show you around my beautiful hometpown and I'm always glad to meet people who are interested in architecture. Hvittrask is definately our national treasure. Thank you for letting me take you there! Maarit was a wonderful tour guide- We all (teenagers to grandparents) enjoyed learning about her beautiful country and Finnish traditions. I would recommend Maarit to any friends and family traveling to Finland. TOUR GUIDE RESPONSE: Thank you, Katrina! It was a pleasure to meet your family. Maarit is knowledgeable and matter of fact. Gave us a good understanding of Helsinki. She was able to make our tour to the Church of the Rock very efficient by knowing when and where to be at the correct time. Saved us tons of wasted time. TOUR GUIDE RESPONSE: Thank you, Barbara. I'm glad that you liked your stay in Helsinki. Maarit was an excellent guide. She has an impeccable command of the English language and tremendous knowledge about Porvoo and Helsinki. She has a great personality and she made our tour memorable. 5 Stars. TOUR GUIDE RESPONSE: Thank you, Tim, for your kind words! It was a pleasure to meet you. My husband, I, and 2 teenage boys had one day in Helsinki. This was a great way to find and see everything we wanted to. Maarit was very knowledgeable and entertaining. We also enjoyed learning a bit about Finnish culture. It was nice to also have a driver so we could just worry about seeing things, not driving. TOUR GUIDE RESPONSE: Hi Jennifer, It was a pleasure to meet you and your family. Please say Hi from me to your boys, very nice young gentlemen :) Have a great summer! The guide did an excellent job of relating the historical events and the Porvoo area. I enjoyed the beauty of the Rock Church and the Cathedral. I will recommend Maarit to anyone as a guide. Maarit was incredibly knowledgable and very friendly! She was prompt to pick us up at desired location and even spent extra time with us getting lunch and taking us to a specific location to be dropped off. She even tailored parts of our tour specifically towards things we would be interested in. Overall, a great tour and quick overview of Helsinki! TOUR GUIDE RESPONSE: Thank you, dear Victoria! It was a pleasure meeting you. Great personality, very professional, great tour. TOUR GUIDE RESPONSE: Thank you! It was a pleasure to introduce my city to you. Enjoy your stay in Helsinki! this was the best tour I ever had anywhere in the world. Maarit was knowledgeable about everything and she was able to personalize the country for me.We covered a lot of ground and it is a day I will always remember. The best! Informative, intelligent, accommodating and funny! Maarit had it all. had a great tour with maarit and it was great and she even took us to a great local winery and a great restaurant. she is a must and I would use her again. she is very funny and makes for a great day and very knowledgeable. I highly recommend her. Maarit is a wonderful guide and I really enjoyed spending time with her will she shared with me her beautiful city, Helsinki. What a great place to live, with beautiful buildings as well as fabulous surroundings. I can highly recommend this tour. Thank you Maarit. Maarit was a very good guide for this tour, very well informed, and took us to all the places that we had asked, Old town Provo was very nice, very picturesque. Maarit in Helsinki was kind and a great conversationalist. We learned what a Finish lifestyle was like. The weather conditions in Helsinki were rainy and we used public transportation to a fault --riding around town without much substance. The transit infastructure is impressive. She did have a recent ankle injury. TOUR GUIDE RESPONSE: Unfortunately the weather was horrible which makes the scenery very dull. Thak you for your kind words. Outstanding! Greatly exceeded my expectations! I am a Finnish/American who was searching for my roots. My guide took me into the remote forests of the Lake Lands, to places with addresses I gave her from over 100 years ago. My guide did much research to locate the tiny forest hamlets and farms that are no longer on the maps. She made contacts to open my church and museums that were closed, and got English speaking docents. She booked the perfect hostel that provided the total Finnish experience. FANTASTIC! 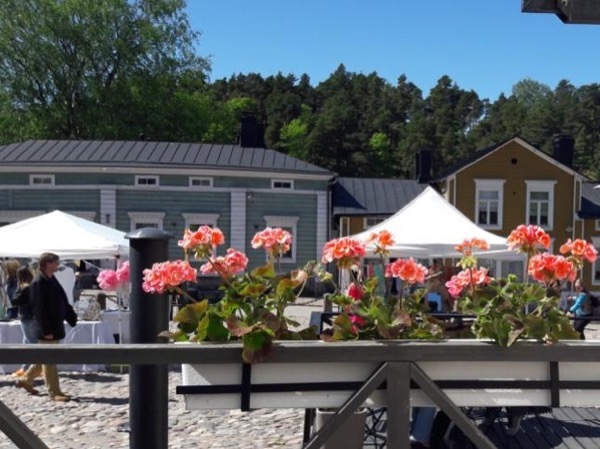 My Tours by Locals guide took me to the port of Hanko on a custom tour. My grandparents had sailed to America from Hanko over 100 years ago. My guide arranged for a tri-lingual Hanko Historian to give me the complete story. She had keys to open the historic buildings and walked us through as if we were walking with my grandparents.....the hotel, innoculation building, ticket office, bank, docks. She had the museum open just for us. We saw the emigrants monument, and so much more. A++! TOUR GUIDE RESPONSE: Thank you Bea, for your kind words. It was a pleasure to take you around and I agree that the Hanko guide was fantastic and the Emmigrant Tour couldn't have been better! Maarit is definitely a 5-star tour guide. She has a deep passion for her country. She is dedicated, sincere, friendly and attentive to details. Please contact Maarit for a guided tour, no matter it is a classic city tour or off-the-beaten-track one! Can't praise her highly enough! Our tour with Maarit was short but packed with some really fun things for the family. She started us with a tour a video game museum which was the highlight of our trip for our youngest son. We visited a few of the classic tourist spots like the rock church and the market and ended our tour with a trip to the ice bar-winter wonderland where the family was able to ride on a sled pulled by huskies and play in the snow. It was a fun day and a nice glimpse of Helsinki. Very knowledgeable. She was wiling and capable to Taylor her experience to our interests . TOUR GUIDE RESPONSE: Thank you, Pat & Don! It was a pleasure meeting you. We enjoyed this tour very much! Although Maarit was sick and unable to be our guide, she arranged to have Anna, a colleague, conduct our tour. We were pleased to be using the public transportation system - it felt as if we were really Helsinki city-dwellers! Anna took very good care of us, making sure that we saw the important sights as well as enjoying some of Helsinki's good food! Maarit went over the top to be helpful when our luggage did not arrive. additionally she provided a first rate tour. She is highly recommended. Maarit was extremely personable.She went out of her way to make us welcome to Helsinki. She met us at the hotel thus began a beautiful adventure. First stop was The Church in the Rock.At each place we visited she told us the history about it and added some anecdotes.She took us to places George wanted to see that his Finnish grandparents always talked about. General Mannerheim grave sight and statue,railroad station and The National Museum of Finland. We met as strangers but left as friends.She's a gem! TOUR GUIDE RESPONSE: Thank you! It was lovely to meet with such a charming couple and a pleasure to be your quide! Maarit is a delightful Finnish lady with numerous stories about life in Finland. She met us on time at the cruise ship and spent 7 hours showing us around. She designed our tour according to my directions .....some city sights plus a ride in the countryside . She arranged a stop at a Finnish composer's home which was a lovely stop to view gardens and home. Maarit was knowledgeable about Finnish history and culture with wit and humor! Great Job! Maarit and her son (our driver) were waiting on the dock when we got off our ship. Our tour from start to finish was personal, thorough and fun. Maarit showed us the area in a much more comprehensive yet relaxed way than we could have gotten with a bus tour and we certainly learned more than we could have on our own. In addition to the sights we expected to see like the Helsinki Cathedral and the Rock Church, she took us into the Olympic stadium, the City Hall and a beautiful shop to see local design.